Thirikadugam / trikatu churna ( திரிகடுகம் ) is a wonderful Siddha & Ayurvedic medicine which can be prepared in our home. Last year, we saw a telecast programme on "Siddha & Ayurvedic medicines" titled as "parambaria maruthuvam"(பாரம்பரிய மருத்துவம் ) in Zee T.V Tamil channel by a well qualified & experienced Doctor Sri.Sakthi Subramanyam. He is continuing it in Sun T.V Tamil channel in the morning 8.30 am - 9 a.m slot. His daughter, also professionally qualified like him, assists him in the demonstration.We thank these two doctors ,who are giving a wonderful demonstration (practical) as well as the remedies for many diseases. They show every herb used in the preparation of the medicines & how to prepare these medicines. A lot of people asks remedies for many diseases- like diabetic, removal of kidney stones, liver related problems like jaundice.In addition to this,they have also discussed the reason for delay in conceiving babies & related problem to both men & women. For all these problems, they show us the herbs normally available in our gardens or open grounds & how to use them. They stress the importance of permanent & preventive cure without any side effects.Taking this improves our immunity. We have prepared "thiri kadugam" medicine shown in this telecast & using it daily as per their advice. This is quite effective in preventing common cold , throat infection & cough.We have been taking this herbal medicine from July 2014 for the past one year.Our son's family including my grand daughter (8 years) is also taking this .This dry powder (5 gms for adults) can bee taken with honey or in warm water inthe empty stomach before break fast.We take it at least half an hour earlier before break fast or tea.We always take it in a small container,when we leave for other places. Some times if we feel sore throat or nose blocking, we immediately take 5 gms in hot water( during long travel or change of drinking water , extreme change of climate) using of this has helped us,once again thank those 2 doctors. This medicine is a combination of "pepper,dry ginger & arisi thippili (available in herbal medicine shops). Take these in equal quantity.Slightly fry this in a pan(without any oil) in the gas stove for one or two minutes .Very light frying, should not be darkened, just to remove if there is any moisture. (வாணலியில் இட்டு இலேசாக சில நிமிடங்கள் வறுக்கவும். ஓரிரு நிமிடங்களில் இறக்கி விட வேண்டும்.எண்ணெய்விட வேண்டாம் ). For trial basis, you take 100gms each.After frying it, grind each one separately in a mixie. ( better to pound it in a grinding stone & then grind it)- உரலில் சிறிது இடித்து போட்டால் மிக்ஸ்சியில் எளிதாக அரை படும். இதனை சல்லடையில் நன்றாக சலித்து ,பொடியாக எடுத்து மூன்று பொடியையும் சம அளவில் கலந்தால் திரிகடுகம் தயார். After grinding,sieve it in a sieve,take equal quantity ,mix it,now thirikadugam medicine is ready. Dry ginger, is hand pounded to ensure the mixie is not spoiled. Sukku is slightly roasted to make it easy for powdering. 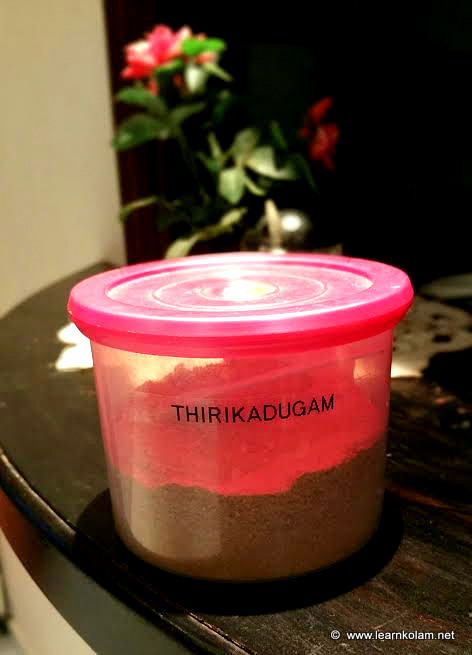 Thirikadugam powder, trikatu churna is ready! Superb explanation & easy way of preparation u have explained. Ur blog complete guide for me. Thank you for explaining this generation. Kolam is really the representation of galaxy . each dot is like a star and in the middle where our sakthee resides. It is about the sun, moon and stars. Thanks for keeping ancient but unique tradition of tamizhans. Great! Thank you Shankar Saranya.We have to thank doctor Sakthi Subramanyam.He is kind enough to tell & show the herbs without hiding anything.So far the usage of these wonder herbs were not explained properly & many herbs were kept as a secret.During 1870 A.D,Vallalar first compiled a dictionary of Herbs , denoting which herb would cure which disease.These herbs if properly given can cure killer disease like cancer,save many persons from kidney failure.Another medicine to be taken in the night is called "Thiripala churanam".This can be also made in the home.This also gives you more benifits, which we would publish soon.My wife is very much interested in the preparation.My role limits with the purchase of herbs.She patiently prepares this & has recorded ,in a note book most of the episodes from the doctor.This involves some manual work . But not much hard work.Of course good quality medicines are available.Those who can spare sometime & interested in this can prepare this on their own.Most of the herbs are available in herbal medicine shops.If a mother knows this medicines,it is naturally passed on to the next generation.I always lend a supporting hand to my wife in this. Oon udambu aalayam. When we maintain our body temple there is no need for mantras..manam athu semmai aanaal manthiram thevai illai.. Ancient wisdom started from tamizhnadu..this is moolathara chakram..the root of civilisation..kolam means science which helps a woman to get the amudam of sky n helps her physically n mentally just like yokam art..yokam means yo (ayya) akam (inside) so yokam is to find the master who resides inside..we have to stimulate the kundalini power..to know the real divine light ..learn abt vallallar.. Sadly tamizhans do not even know that the art of yokam (yoga) and meditation started from tamizhnadu by our chithars.. One who has seen chithai (fire) in him is called chithar (siddar). Yoga is a short form of yokam . Truth shall triumph! Justice shall prevail! Vaazhka tamizh! Vaazhka tamizhakam! Kumari muthal thiruvenkatam (kashmir) varai vaazhnthavan tamizhan.. Unmai azhivathu illai.